Battery treatment is based on a physical-mechanical process developed in two different stages: crushing and separation of battery components and treatment of effluents. Crushing and separation involve the breaking of the battery and separating its lead and plastic components, as well as segregating the acid electrolyte, which becomes part of the process waters that are subsequently purified at the effluent treatment plant, where high-quality water is obtained and reused at the Azor facilities. The lead materials obtained are reprocessed in the Azor Ambiental furnaces, in order to obtain secondary lead to be used in the manufacturing of new batteries and other lead products. 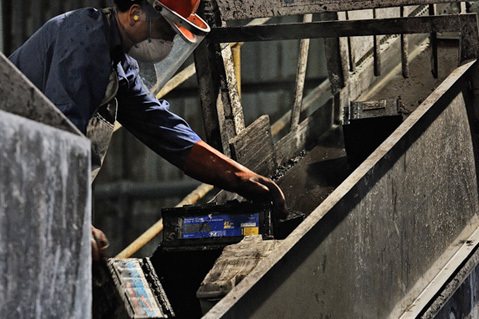 The plastic and remaining segregated materials from the battery are sent to officially designated managers for them to proceed to their recycling and recovery insofar as it is possible.